Four years on from the Auditor General’s report we finally see some real action on the opening up of the Caulfield Racecourse. Within 5 years, training facilities (tracks and stabling), located on the Reserve’s Crown Land, will be removed and the huge centre of the reserve opened up for public recreation and park usage. As always information is scant and there are loads of major questions re what this actually means for public usage (staged implementation, development and funding of facilities) vs. those areas of Reserve to be leased for 65 years ( leasing arrangements ie areas, lease fees, terms and conditions). A huge break, though how huge remains to be seen. Unfortunately there are many public $’s being directed to Racing, rather than public usage, and another 65 years (up from 21 years) before any “next” break through. The Andrews Labor Government is building new infrastructure and creating hundreds of new jobs at the Cranbourne Training Complex and Pakenham Racing Clubs as part of a major boost for racing in Victoria. Minister for Racing Martin Pakula today announced a $17.5 million investment to create new facilities at both the Cranbourne Training Complex and Pakenham Racing Club as part of a $40.1 million joint funding package. Thoroughbred training at the Caulfield Racecourse Reserve will be relocated over the next five years, to open up the reserve for greater public access and recreational use. The Labor Government will invest more than $6 million at the Cranbourne Training Complex for the construction of additional stabling, an inside grass track, an equine pool and tunnel upgrades to accommodate additional horses. More than $8 million will also go to the Pakenham Racing club for new stabling, new uphill grass and synthetic tracks and an additional equine pool. The project will accommodate an additional 600 horse boxes and create up to 200 new jobs during construction, with a total economic impact estimated to be more than $250 million. Racing Victoria and the Melbourne Racing Club will contribute $22.6 million towards the project. Works at both facilities will begin immediately, to help relocations which may begin from mid-2020. Trainers will have up to five years to relocate from their existing facilities at Caulfield Racecourse Reserve. The Government has approved a long-term lease between Caulfield Racecourse Reserve Trust and the Melbourne Racing Club to increase recreational opportunities and secure horse racing at the reserve for another 65 years. As part of this, the Government will provide an additional $1 million to support the Trust to develop a long-term land use plan for the site, to open up the space and balance the needs of residents, racing stakeholders and community groups. The Trust will develop a three year corporate plan that will set out the strategic direction and management of the reserve in close consultation with the local community. We’ve been asked by a group of concerned Elsternwick residents to draw the community’s attention to a retrospective planning permit application to operate a residential* Drug Rehabilitation Centre on the former Daily Planet Brothel site – 7-12 Horne Street, Elsternwick. The site, recently acquired by a developer, has been let and is currently operating as a residential drug rehabilitation centre. Residents have advised that initially Council Officers felt (mistakenly in GERA’s view) that the site’s zoning of Commercial 1 did not require a planning permit for use as a residential drug rehabilitation centre. However, the below significant issues, raised by residents since the centre commenced operating many months ago, has resulted in a Council “re-think”. Hence the permit (Application No. GE/CP-32039/2018) now being sought for the already operating centre. asking that the current permit application be rejected and current operations cease. seeking assurances that, should a future similar permit application be received, appropriate facilities and security provisions are provided and the due planning approval process is followed, prior to the commencement of operations. Council is scheduled to discuss and decide the application at the 7/11/2018 Ordinary Council Meeting. There was no letterbox drop. Supposedly this meets planning regulations. We are disappointed by this and we believe the community is not fully aware of what is going on around them, but are not questioning this part of the Act. Council are letting them operate without a permit and were allowed to continue to do so whilst they undertook the application process. Rules for some, different for others. The centre is an operational drug and alcohol rehabilitation clinic. Patients have moved in will live on site for up to 3 months (24/7). The centre appears as a brothel and we question whether it is actually ‘habitable’. They will accept anyone from heavy drug addicts (ice, heroine, MDMA, cocaine, etc) alcoholics, physiological problems to relationship issues. Such a range of conditions would require a very broad range of expert care. Their application proposes 1-2 staff for every 6 patients. Patients would be prescribed drugs whilst they are living on the premises and would be walking the local streets to collect these drugs themselves from the chemist. Patients would be accessing the building from all possible entrances/exits (including the alley ways which access residential properties). They are free to come and go as they please. No renovation work had happened inside as of June 2018, and we suspect this is still the case (directors mentioned lack of funds and no construction vehicles have been seen in the area since). It sill presents as the brothel once did (I am told and assume having never been in a brothel before). Soft furnishings still remain ( I understand they have acquired much of the furniture off the brothel), images of naked women adorned the walls, the bedrooms were kitted out with multiple beds and fully operational spa baths, mirrors etc. Not the type of environment we would have assumed would be conducive to rehabilitating patients?! They have signed a 5 year lease. They implied the business had been set up by 3-4 individuals. They would not provide any clarity around who they were, what experience or qualifications (if any) they had. The ‘deal’ was proposed by one of the brothel staffers who ‘knew’ all the relevant parties and ‘set up the deal’ in his words. He still works there as of June 2018. Patients will pay $10k per month. They could not clarify what security would be put in place. They said there were operational camera’s already installed however the only camera down the alleyway that accesses residential property has been seen disconnected and is facing a roof. Residents and business owners have already noted windows have been smashed since the business opened and the number of ‘questionable characters’ hovering and walking the local streets and laneways has markedly increased with some residents experiencing disputes erupting from the premises that made them feel incredibly unsafe. We understand that this type of establishment has very few rules/regulations around its operations. Certain residents have been informed that this specific organisation is recruiting its patients from the outside the courts – offenders waiting for trial and wanting to seek bail must be enrolled into a centre like this one which will keep them out of jail. We appreciate the history of this site has been an interesting one but are seriously concerned with the type of clientele this facility is attracting and the lack of transparency and professionalism shown by the staff/operators. One of our facebook readers has added the below link to our page. It’s a 2016 Four Corners program on the private rehabilitation industry in Australia – the reader comments that very little has changed since the program aired. This posting serves as a reminder to those who were notified of the below Information Session and to extend the invitation to attend to others interested redressing Glen Eira and Stonnington’s chronic shortage of parkland and sporting facilities. As per the 2014 Auditor General’s Report, due to poor management of Reserve (the former Trust) and lack of oversight (by successive State Governments) has enabled its racing purpose to dominate the Reserve’s 54 hectares to the detriment of its public park and recreation purposes. establish a transparent and modern governance model for the Reserve management. While it’s still “early days”, the Information Session is the first step in a long process that gives the community an unprecedented opportunity for input into ensuring future Reserve usage recognizes and serves the needs of the community. 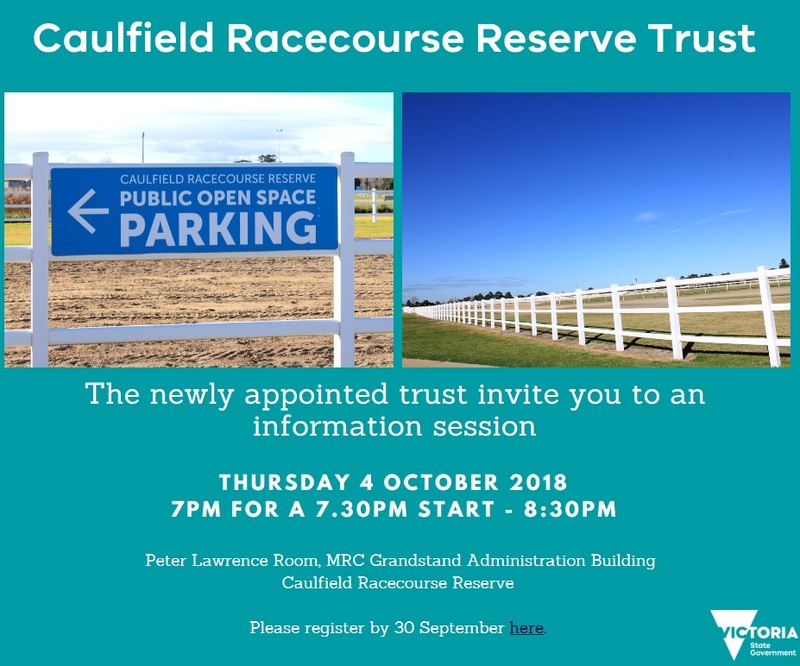 The newly appointed (1st August, 2018) Trustees of the Caulfield Racecourse Reserve have committed to holding three to four community information sessions a year plus an annual public meeting to engage and be transparent with the community about the management of the reserve. Below is an invitation to the first community information session to be held on 4 October 2018 at the Caulfield Racecourse Reserve. The meeting will discuss the priorities the Trust has set for the next twelve months; including appointing a Chief Executive Officer and developing a land management plan, so come along meet the new trustees and ask questions. Register your attendance via the link at the bottom of the above invitation and please circulate amongst your community. Please note: An alternate registration link is Community Information Session: Caulfield Racecourse Reserve. 11 hectares (20%) is under lease for racing purposes. The Annual rental of $170K is generally returned to the MRC for racing related projects. only 6 hectares (11%) is available as open space for the potential use of the community. That 6 ha comprises facilities that do not meet the needs of community, are not easy to physically access and are subject to restricted usage times. No similar accessibility issues and time restrictions are applicable to racing usage. The South Caulfield Action Group (SCAG) have invited our State MP, Mr David Southwick, together with our Camden Ward Councillors, Joel Silver and Dan Sztrajt, to hear our stories. They need to understand why we signed the petition. Now is the time for our voices to be heard. We need to demonstrate that there are many people concerned about the future of Caulfield South Neighbourhood Centre. a possible upgrading of the Caulfield South Activity Centre from being a Neighbourhood (“lesser”) Centre to that of an Emerging Major Activity Centre. SCAG feedback indicates that planning officers believe the upgrade has already occurred. lodging of a petition with Council for the implementation of a 2 storey height limit on small lots – 293 signatories and growing. A flyer depicting potential developments is attached. Organizing the above meeting, to raise residents’ awareness of proposed planning changes and give the residents the opportunity to voice their views to those they have elected. a determination to see residents views are duly considered with decisions that impact the South Caulfield Activity Centre are made. Comparative graphical presentation of ABS 2017-2018 Building Approvals – Glen Eira and other Metro Melbourne Councils. GERA encourages residents to support this group and to attend the meeting. “The Victorian Planning Authority is leading the preparation of a structure plan for the Caulfield Station Precinct, in partnership with Glen Eira City Council, Stonnington City Council, the Department of Environment, Land, Water and Planning (DELWP) and Transport for Victoria (TfV). You are invited to share your thoughts and ideas about how to best shape the future of this place for the community by attending a Community Visioning Workshop. The purpose of this workshop is to inform the community of the planning process and to seek views and input into the future of the area. GERA strongly urges both Glen Eira and Stonnington residents and recreational/sporting groups and clubs to attend this workshop to get an understanding of what is being proposed and an awareness of it’s potential “flow on” impacts for surrounding areas. We also encourage completing the VPA online survey. The initial information and input session focuses on the four core activity centre components and their connectivity within the precinct. The significant planning and development implications for Glen Eira (south of Dandenong Road) and Stonnington’s (north of Dandenong Road) surrounding commercial/residential areas and proximate activity centres are to be included in subsequent consultations. Recent multi storey multi unit developments, along the northern side of Dandenong Road, indicate the development potential of the areas surrounding the precinct. Buildings varying in height from 2 stories along Kambrook Road to a 20-22 storey office /residential tower located near the Station. Worth noting is the redevelopment potential (multi-storey multi units) of MRC freehold land located along Kambrook/Booran Roads (shown on the above map as Horse Training and Stabling). This potential was flagged during the Strategic Land Management consultations conducted by the former Reserve Trustees in 2015. The current status of redevelopment plans is not known. an expansion from 10,000 Effective Fulltime Students (EFS) to 25,000 EFS. Construction of a series of high rise buildings to provide educational and administrative facilities with some retail facilities at ground level. 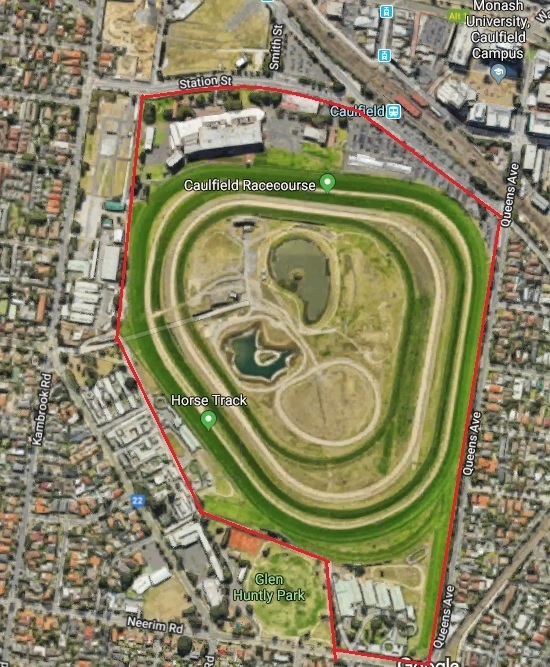 The Racecourse comprises 54 ha, of the 122 ha now designated the Caulfield Station Precinct, and offers a significant open space opportunity for Glen Eira (which has the least per capita open space/parkland in Metro Melbourne, coming in at less than half the Metro average) and Stonnington (which has the 2nd least). Both the size and location of this crown land make it suitable to service the recreational (passive and active) needs of the volumes (ie. residents, students, workers and patrons) expected to access the Precinct, as well as the needs of the increasing residents of the surrounding areas. Striking an equitable balance between public recreational usage and racing usage has long been a contentious issue and recently resulted in changes to management of the land that have yet to come into effect. 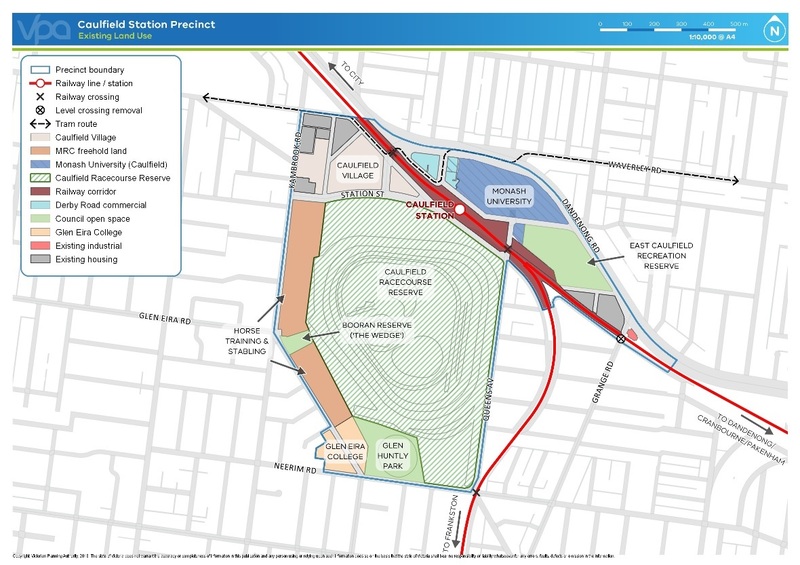 While GERA is not aware of plans to redevelop the heritage listed Caulfield Station, we believe its redevelopment (presumably as a rail/tram/bus interchange) will be required to service the public transport needs of those accessing the Precinct. When/if redevelopment occurs, it should include the “place making” historic Station and heritage listed buildings in Derby Road. Currently, the connectivity of the above core components is poor. It is restricted by the extremely divisive railway line and a fragmented road network. While access between Caulfield Village, the Racecourse and the Station is basically “across the street”, accessing Monash from these locations is restricted to 3 underpasses ie. Queen Avenue, Caulfield Station and Station Street. Free movement flows (predominantly pedestrian, with some vehicular movement for the provision of goods and services) within the Precinct is essential to enable synergetic development of precinct facilities (eg. auditoriums, open space and car parking) and ensure the long term viability of a cohesive activity centre. *Caulfield Station Precinct – is the previous Priority Development Zone, known as the Phoenix Precinct (ie. Caulfield Village and Monash University Caulfield Campus) expanded to include the Caulfield Racecourse & Recreation Reserve, Glen Eira College and Glen Huntly Park. Below is an email received from the BHCA group, who mounted an extremely effective, community based campaign against the proposed re-development of the Calvary Healthcare Bethlehem Hospital site located in Kooyong Road, South Caulfield. During the course of their campaign, the original proposal for inclusion of a 19 storey tower was modified to 10-11 stories. As per the email, the just published VCAT decision has approved the modified proposal (ie. 10-11 stories) on the basis that “retirement villages are exempt from height limits”. In this case, the surrounding residential areas is zoned Neighbourhood Residential and has a 2 storey height limit. I am not usually in the habit of looking back, but as we have learned of VCAT’s decision, I remember that horrible sinking feeling that we all experienced when we learnt of Calvary’s proposed 19/20-storey tower. While everyone recognised that the Bethlehem hospital site was ripe to be updated and improved, we all understood the deep impact that development on the scale proposed would have on the neighbourhood character and the direct effect on surrounding properties. The community knew that this proposed development needed to be resisted. It was with your support – moral, practical and financial, that we, as a community, forcefully expressed our objection in this administrative VCAT process against the high-powered team of barristers and experts engaged by Calvary. The decision issued by VCAT has not stopped the redevelopment of the Bethlehem Hospital by Calvary. It has, however, fundamentally reshaped it. VCAT has directed the Glen Eira City Council to issue a permit for the redevelopment of Bethlehem Hospital that is now 10/11 storeys. The appearance of the buildings is more articulated with a finer grain exterior. The retirement village, aged care and ancillary uses are now more evenly spread over the site. The 90 place childcare centre has been abandoned. The inadequacy of the car parking arrangements were acknowledged and the at-grade car park on the corner of Saturn Street and Kooyong Road reserved, as a condition of the permit, as a permanent carpark, serving to somewhat alleviate the pressure on the surrounding streets. I hate to think what might have been the outcome of the VCAT process without the local community’s engagement of strong legal representation and expert witnesses. Attending each day of the hearing demonstrated to me that this was the right approach and that our well-argued objection contributed to a revised development that is substantially reduced in scale. It also confirmed to me that had we relied solely on the promises of our elected councillors and allowed the Glen Eira City Council to prosecute our objections alone, it would have been a major folly. Significantly, and notwithstanding our expertly constructed legal arguments about the application of height limits on retirement villages, VCAT determined that retirement villages are exempt from height limits, setting a new legal precedent that I am sure will be adopted by other developers throughout the suburbs of Melbourne. (Incidentally, it appears that VCAT’s decision has introduced an even bigger loophole to the planning regulations for applications made prior to the current act – time will tell what impact this has). For those that wish to read the VCAT decision, it is attached. As the spokesperson for the BHCA Group and the local community, and in what will be the last communication to the group, I would like to thank everyone for the energy, financial contributions and support to defend the character of our local streets and the amenity of our own properties. I am firmly of the view that without it, we could not have achieved any amendment to the original scheme. Since Council’s early (ie. 1 day) release of the above Structure Plans to be submitted, for approval, to the 27/02/2018 Ordinary Council Meeting, GERA and residents have struggled with reviewing the volume of information released (approx. 500 pages of Agenda Items and 14 support documents) within an extremely tight timeframe. (5.5 days vs. a planned 4.5 days). that sufficient information has been presented to residents in a timely, readily accessible and understandable manner. Additionally, feedback received by residents and GERA indicates that these is little point in residents undertaking or presenting any analysis as the Councillors are going to approve. Council should defer voting on the Bentleigh, Carnegie and Elsternwick Structure Plans and Quality Design Guidelines included as Agenda Items 9.1 – 9.5 for the 27/2/2018 Ordinary Council Meeting. The “Deferral Time Period” should that deemed sufficient to enable residents to provide informed feedback on the Structure Plans and for Council Officers to review and assess that feedback before a Council decision is made. This would be in line with the Minister’s direction that states “Council needs to exercise it’s responsibilities under the Act and review and strengthen it’s scheme in consultation with the community”. Council should remove from Officer’s Report Recommendation – Point 3 the wording “in accordance with Section 20(4) of the Planning and Environment Act 1987”. This removal is to apply to all Structure Plans and Quality Design Guidelines presented to Council – currently or in the future. – Does not align with the principles of good consultation or Council’s proclaimed goal of improving community consultation practices. Feel free forward a copy (or an amended copy) of this email to Councillors – just made sure you include your name, street address and telephone/mobile contact details. Glen Eira Council will vote on the Elsternwick, Bentleigh & Carnegie structure plans on Tuesday night from 7.30pm at the Glen Eira Town Hall. 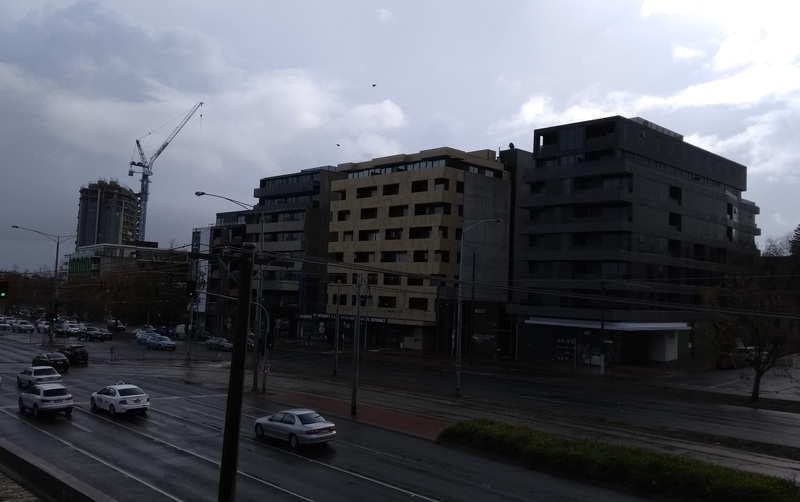 Elsternwick residents will be WEARING BLACK to signify the massive overshadowing of the proposed 12 storey highrise city in Elsternwick. If you are opposed to the highrise elements in any of these plans, you may like to join the Elsternwick residents and wear BLACK on the night to show your support. TREE PROTECTION – PROGRESS OR NOT?